We went to Kyoto last weekend and had Modan-yaki with our friends. 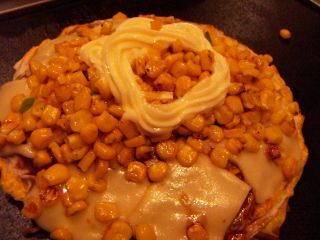 Do you know what Okonomiyaki is? 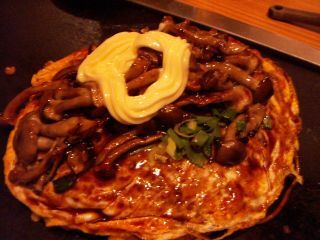 Modan-yaki is one of the versions of Okonomiyaki. 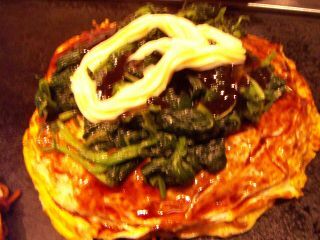 Okonomiyaki is, let's say, Japanese Pizza and if you add noodle on it, it's called modan-yaki. OK, I'll show you them! Our friends are vegetarians so we enjoyed variety of vegetable taste Modan-yaki! This is cheese and corn. 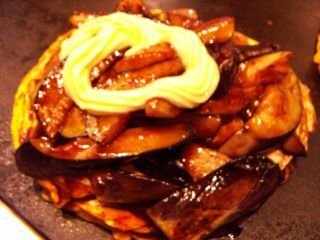 And finally, eggplant or maybe British people call it aubergine! Looks delicious? Yes it tasted "buono"!! 次の記事へ：The script of my in-class presentation "Women & Stress"